The United States Capitol Building is located in Washington, D.C., at the eastern end of the National Mall on a plateau 88 feet above the level of the Potomac River, commanding a westward view across the U.S. Capitol Reflecting Pool to the Washington Monument 1.4 miles away and the Lincoln Memorial 2.2 miles away. Take a 360° degree virtual tour of the U.S. Capitol Building. Dimensions: 751 feet 4 inches long; its greatest width is 350 feet. Its height above the base line on the east front to the top of the Statue of Freedom is 288 feet. At the U.S. Capitol Building the Senate and the House of Representatives come together to discuss, debate and deliberate national policy; develop consensus; and craft the country's laws. As the nation has grown so has the U.S. Capitol Building: today it covers well over 1.5 million square feet, has over 600 rooms, and miles of corridors. It is crowned by a magnificent white dome that overlooks the city of Washington and has become a widely recognized icon of the American people and government. The U.S. Capitol's design was selected by President George Washington in 1793 and construction began shortly thereafter. The U.S. Capitol Building is among the most architecturally impressive and symbolically important buildings in the world. It has housed the meeting chambers of the Senate and the House of Representatives for over two centuries. Begun in 1793, the U.S. Capitol has been built, burnt, rebuilt, extended and restored; today, it stands as a monument not only to its builders but also to the American people and their government. As the focal point of the government's Legislative Branch, the U.S. Capitol Building is the centerpiece of the Capitol Campus, which includes the six principal Congressional office buildings and three Library of Congress buildings constructed on Capitol Hill in the 19th and 20th centuries. In addition to its active use by Congress, the U.S. Capitol is a museum of American art and history. Each year, it is visited by an estimated 3-5 million people from around the world. A fine example of 19th-century neoclassical architecture, the U.S. Capitol combines function with aesthetics. Its designs derived from ancient Greece and Rome evoke the ideals that guided the nation's founders as they framed their new republic. As the building was expanded from its original design, harmony with the existing portions was carefully maintained. 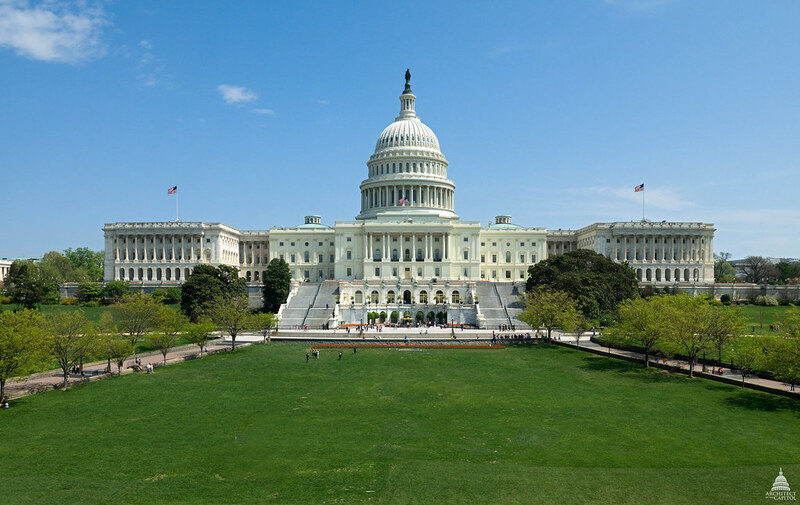 Today, the U.S. Capitol Building covers a ground area of 175,170 square feet, or about 4 acres, and has a floor area of approximately 16-1/2 acres. Its length, from north to south, is 751 feet 4 inches; its greatest width, including approaches, is 350 feet. Its height above the base line on the east front to the top of the Statue of Freedom is 288 feet. The building contains approximately 540 rooms and has 658 windows (108 in the dome alone) and approximately 850 doorways. The U.S. Capitol Building is divided into five levels. The first, or ground, floor is occupied chiefly by committee rooms and the spaces allocated to various congressional officers. The areas accessible to visitors on this level include the Hall of Columns, the Brumidi Corridors, the restored Old Supreme Court Chamber, and the Crypt beneath the Rotunda, where historical exhibits are presented. The second floor holds the Chambers of the House of Representatives (in the south wing) and the Senate (in the north wing) as well as the offices of the congressional leadership. This floor also contains three major public areas. In the center under the dome is the Rotunda, a circular ceremonial space that also serves as a gallery of paintings and sculpture depicting significant people and events in the nation's history. The Rotunda is 96 feet in diameter and rises 180 feet 3 inches to the canopy. The semicircular chamber south of the Rotunda served as the Hall of the House until 1857; now designated National Statuary Hall, it houses part of the Capitol's collection of statues donated by the states in commemoration of notable citizens. The Old Senate Chamber northeast of the Rotunda, which was used by the Senate until 1859, has been returned to its mid-19th-century appearance. The third floor allows access to the galleries from which visitors to the Capitol Building may watch the proceedings of the House and the Senate when Congress is in session. The rest of this floor is occupied by offices, committee rooms and press galleries. The fourth floor and the basement/terrace level of the U.S. Capitol are occupied by offices, machinery rooms, workshops and other support areas.